At 7:00 PM on Tuesday April 23, Little Falls Historical Society member Byron Roff will make a presentation on the role of DNA evidence in conducting family genealogical research. Roff’s presentation will take place at the WCA, located at 534 Garden St. and is free and open to the public. Roff has extensive experience in this field, having conducted genealogical work and made similar presentations and lectures across central New York and in the Hudson Valley. His presentation at the WCA will focus on his own experience of using Ancestry DNA and on the relative advantages and disadvantages of both DNA and paper-based genealogical research. The evening’s presentation will be preceded by a short Historical Society business meeting andrefreshments will be served afterwards. The presentation on March 26 at the WCA was so well attended that there was standing room only! Mike Potter presented wonderful photos that dated from late the 1800s to the early 1900s. The photos highlight Little Falls streets and transportation during that time period. The Little Falls Historical Society Museum works to preserve and highlight the community’s history. Members of the society work hard to collect, archive, digitize and otherwise preserve Little Falls’ story. This photo is one of many that can be found in David Krutz’s book, Distant Drums, Herkimer County in the War of the Rebellion. The book offers a unique insight into the Civil War period including stories and photos of the area. Distant Drums can be purchased at the Little Falls Historical Society Museum. It’s an amazing, one-of-a kind look into Little Falls and the rest of Herkimer County during this important time in our history. David Krutz was born, raised, and still resides in Little Falls, New York. He is a graduate of Utica College of Syracuse University, and has been a life-long student of the Civil War. This is his first literary effort. S. Ann-Bridge St. prior to 1930’s where Canal Place is now located. 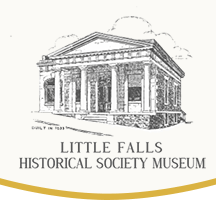 The first meeting and presentation of the Little Falls Historical Society for the 2019 season will take place on Tuesday March 26 at 7:00 PM at the WCA located at 534 Garden Street. The presenter is Historical Society member Mike Potter who will display and provide narration for old photos of Little Falls streets and various modes of transportation from a bygone era. Mike and Gail Potter have been hard at work for the past few years digitizing the Historical Society’s large collection of old picture slides. Many of these photos have not been displayed publicly for many years. Mike’s presentation will use many of these newly digitized photos. This presentation will be preceded by a short Historical Society business meeting. Light refreshments will follow the presentation. All Historical Society meetings and presentations are free and open to the public. Many stories abound in Little Falls from the Roaring 20’s era of Prohibition which lasted from 1919-1933. Some of our parents or grandparents may even have violated the Volstead Act. This law attempted to establish the legal apparatus to enforce the 18th Amendment which outlawed the manufacture, sale, and transportation of most alcoholic beverages. There are a number of newspaper articles from that time period about bootlegging criminal activity and police arrests. The Little Falls Historical Society intends to construct an exhibit on “the Little Falls Prohibition story” for the 2019 season to commemorate this centennial. We need help. If any person or family has in their possession Prohibition related artifacts – bottles, stills … etc. – or any stories which they wish to share for exhibition purposes, please contact us. Contact numbers are: Jeff Gressler at 823-2799, Louie Baum at 867-3527, or the Historical Society museum at 823-0643.